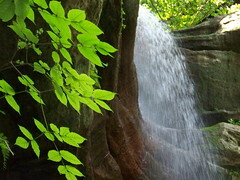 Today I'm sharing a photo I took in the summer at Starved Rock of a waterfall. Enjoy. I know for me, I can't wait till spring but for now it's snow everywhere. Water in your place has gone through the complete cycle; solid, liquid and gas, which is snow, water, and vapour. We only have two here, water and vapour without snow. What a fluid and fantastic shot. Wow, well done diane. Thanks! I am looking forward to spring. I really like waterfalls. I'd love to be able to see something like this myself. My area is too flat for any here.